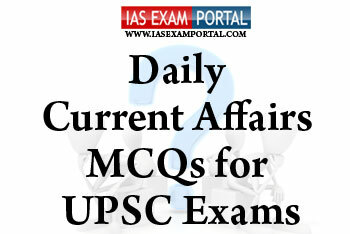 Current Affairs MCQ for UPSC Exams - 09 FEBRUARY 2019 | IAS EXAM PORTAL - India's Largest Community for UPSC Exam Aspirants. 1) The Street Vendors (Protection of Livelihoods & Recognition of Street vendors) Act in 2014 plays a very important role in protecting the rights of urban street vendors and regulating the street vending activities. 2) The Support to Urban Street Vendors (SUSV) which is one of the components of DAY-NULM, seeks to address the concerns of urban street vendors by creation of a pro-vending infrastructure. 3) SUSVaims at addressing the vulnerabilities of the urban street vendors through a multi-pronged approach includingsurvey of street vendors, issue of ID cards, development of city street vending zones and vending plans, training and skill development, access to credit and linkages to social security schemes. Q2. The Department of School Education and Literacy has launched the “SamagraShiksha” - an Integrated Scheme for School Education as a Centrally Sponsored Scheme with effect from the year 2018-19. Q3. Which of the following statements regarding the jurisdiction of CBI are true ? 1) In exercise of powers under Section 2 (1) of Delhi Special Police Establishment (DSPE) Act, 1946, the Central Government constitutes a Special Police Force for investigation in any Union Territory of offences notified under Section 3 of DSPE Act, 1946. 2) The power and jurisdiction of this Special Force can be extended by virtue of DSPE Act, 1946 to any other areas/State not being Union Territory for investigation of any offences or classes of offences under DSPE Act, 1946 even without the consent of the Government of that State. 3) Also constitutional courts can also entrust any case or class of case for investigation in exercise of inherent jurisdiction even without the consent of the respective State Government. 1) The solid wastes generated from nuclear facilities, depending upon their radioactivity content are stored/ disposed of in engineered structures such as stone lined trenches, reinforced concrete trenches etc far away from the nuclear facilities. 2)The areas where the waste disposal structures are located are provided with bore-wells in a planned manner which are routinely monitored to confirm effective confinement of radioactivity present in the disposed waste. 3) The monitoring of various environmental matrices such as air, water, soil etc., in and around the waste disposal facilities is carried out by independent Environmental Survey Laboratories (ESL) of Bhabha Atomic Research Centre (BARC) which are stationed at all the nuclear sites. Q5. The AtalBhujalYojana (ABHY), a Rs.6000 Crore scheme, for sustainable management of ground water with community participation andenvisages active participation of the communities in various activities such as formation of ‘Water User Associations’, monitoring and disseminating ground water data, water budgeting, preparation & implementation of Gram-panchayat-wise water security plans. The scheme is being implemented by Central government and which of the following global organisations on 50: 50 basis ?